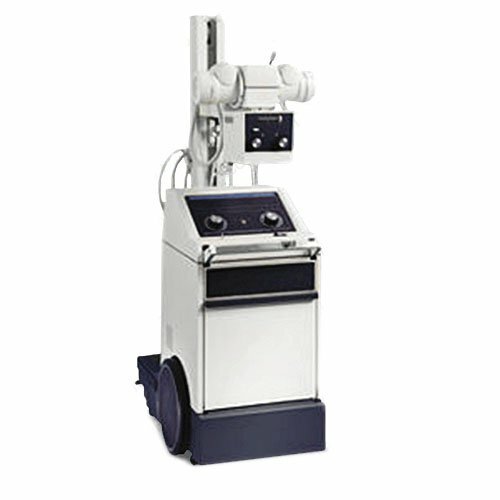 GE AMX III mobile X-ray systems are based on the revolutionary AMX family of portables. These mobiles are designed to take patient care to new heights. They’re more compact and more powerful than their predecessors. Ready at a moment’s notice, these systems offer the latest in GE’s mobile imaging capabilities. Operates bedside at full power with auxiliaries without a power connection. Variable speed, forward and reverse. Constant-potential output makes 100 mA rating equivalent to 200 mA single phase conventional generators. The rechargeable battery pack has a capacity of 10,000 mAs measured @ 100 kVp; proportionally more mAs at lower kilo voltages. Silicon high-voltage rectifiers and solid state timer for consistent results. kVp accuracies subject to additional ±(5% + 2kV) and mAs to ±3% accuracy of instrumentation used for calibration and measurement. Handswitch must have been released for 25 seconds after previous exposure. 15-minute interval after change completion with the key switch in ON or CHARGE. Minimum inherent filtration is 1.5 mm aluminum equivalent to 150 kVp. Additional filtration may be obtained by inserting 1 mm and/or 2 mm aluminum filters. Minimum source-to-skin distance is limited to more than 30 cm by the tracks on the bottom of the collimator for mounting the accessory extension cylinder. Full 17″ x 17″ (.43 m x .43 m) radiographic coverage at 40″ (1.02 m) source to image distance is provided for tubes with a 15-degree target angle. The collimator can be rotated and locked positively at 0°, ±15°, ±30°, ±45°, and ±90° from the front position.